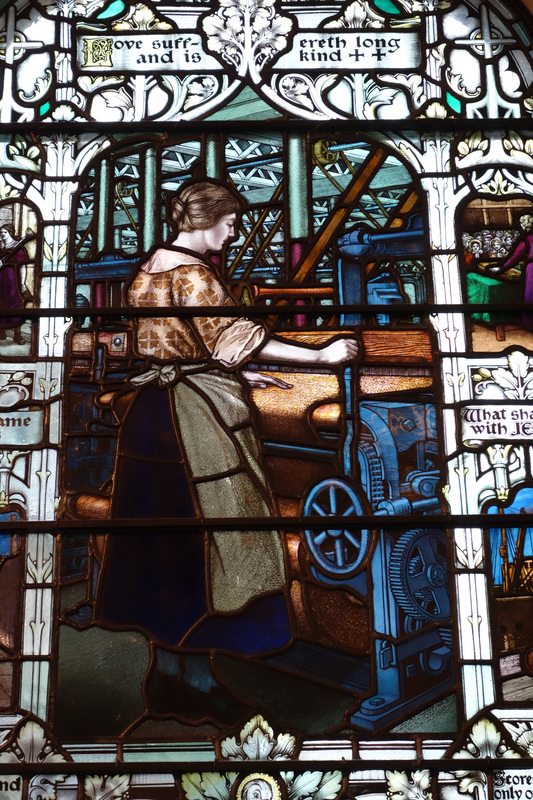 Here’s another for the small collection of stained glass windows showing industrial scenes. It shows a Dundee jute factory with a mill girl – in fact Mary Slessor, who went on to be a missionary in Africa – along with a pretty correct depiction of the machinery, line shafting and all. It dates from 1923 and was designed by William Aikman as a memorial to Slessor; it can be found in the café at the McManus Gallery in Dundee. Great excuse to pop in for a coffee…. though I just paid a flying visit (almost literally) while in the city to take a photo of the massive and very wonderful Cox’s Stack out at the Camperdown Works. It is a polychromatic chimney which could be straight out of Rawlinson’s 1850s chimney design monograph. Now stands rather sadly in a ‘leisure park’ where various efforts have been made to copy its polychromy.